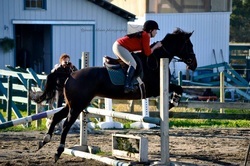 We believe in Personalized Individual Training for both rider and horse. Each person and each horse is an individual with a specific body type, conditioning, and training level. In order to exercise the full potential of an athlete we help to modify the physical and mental conditioning of the subject on an individual basis. If you have dreamt of becoming a better athlete, rider or horseman, we at Gloucester Downs Equestrian Park can help you to achieve your goals. Whether you are a novice adult amateur rider and wish to get in shape, or you are a professional equestrian and want to improve your performance we have the technology and the training to help you. We will help you to define your short and long term goals, and we will develop a Personalized Training Plan that is both realistic and progressive. We will create a Training Contract to help you with the management and outcomes of the goals and we will guide and document your training and progress so that you have both a written and visual record of where you have been on your training path. Like all learned skills, riding horses requires a multi-faceted approach: a learning plan, instruction, physical and mental training, practice, evaluation, analysis, and refining of skills. Whether you are a dressage rider, reiner, showjumper, hunter, or eventer, we can help you to improve your communication with the horse and increase your communication vocabulary. Contact us for more information or to arrange an evaluation lesson.